Doors in public buildings have certain requirements during construction that enable handicapped users to operate them with ease. The Americans with Disabilities Act (ADA) sets out the guidelines for construction with regard to handicapped access. 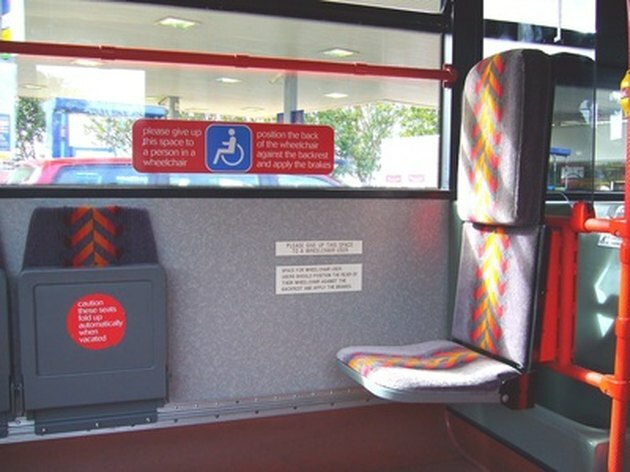 Wheelchair users can be assisted by adaptations. Under the ADA guidelines, the hardware required to operate the door must be no higher than 48 inches above the floor. If all that is required to open the door is for the wheelchair user to push against it with his wheelchair, then a kick-plate should be installed on the door. This should measure the width of the door minus two inches and be at least 16 inches high. Acceptable hardware to be installed for opening a door includes: handles, latches, pulls and locks. Lever-operated mechanisms, push-type mechanisms and U-shaped handles are acceptable designs. The hardware must be accessible from both sides of the door if a sliding door is being used.